Frédéric Guesdon, FDJ sports director for the Belgian weekend: „For those two races, Arnaud Démare will be our natural leader. We built a team around him to support him and make sure he is not isolated in the finish, like it happened sometimes before. That being said, we noticed those last years that the riders tend to reveal themselves earlier and earlier on the Classics. It means we will have to be present at the front and this could be the role of riders like Ignatas Konovalovas or Olivier Le Gac. While being a nice option if anything happens to Arnaud, Marc Sarreau will be back in the train for Kuurne-Brussel-Kuurne, the more suitable to a sprint finish. Omloop Het Nieuwsblad is usually more open, it might enable another guy to have his own chance“. The first Monument Race of the year, now in its 108th edition, announces its Start List. Milan, 17 March 2017 – The 108th edition of Milano-Sanremo, the first Monument Classic of the season, is set to take place tomorrow, starting in piazza Castello at 9.45 and finishing in Via Roma after 291km, with 200 riders representing 25 teams. Defending champion Arnaud Démare (FDJ), former winners John Degenkolb (Trek – Segafredo), Alexander Kristoff (Team Katusha Alpecin), Simon Gerrans (Orica – Scott), Mark Cavendish (Team Dimension Data) and Filippo Pozzato (Wilier Triestina – Selle Italia) are among the big names on the start list released today (see attachment) along with Olympic Champion Greg Van Avermaet (BMC Racing Team), World Champion Peter Sagan (Bora – Hansgrohe), and the in-form sprinters Fernando Gaviria (Quick-Step Floors), Elia Viviani (Team Sky), Nacer Bouhanni (Cofidis, Solutions Crédit), Michael Matthews (Team Sunweb) and Sonny Colbrelli (Bahrain – Merida). The 108th Milano-Sanremo NamedSport will be broadcast in 185 countries right across the five continents. The 2017 edition of the race will be shown live by 16 TV networks. RAI, the WorldTour event’s host broadcaster, will produce three hours live coverage of the race, broadcasting it in Italy on Rai Sport + HD, with the final part live on Rai 2. Eurosport will show La Primavera live throughout the whole of Europe, with the exception of France where l’Equipe will air the race on its free-to-air channel. In Switzerland the race will be broadcast by SRG SSR and in Belgium by the French speaking channel RTBF. In Asia, the exclusive live broadcast in Japan will be on DAZN, while in China the race will be broadcast on the Web TV Hysport. Eurosport will also broadcast the race in 15 territories across the Asia Pacific region, while in New Zealand the Milano-Sanremo NamedSport will be broadcast exclusively on Sky Sports. OSN network is the right holders for the Middle East and Africa regions, while Kwese Sport will cover the SubSaharian Africa territories with the sole exception of South Africa, where the race will be broadcast live on Supersport. The 2017 Milano-Sanremo NamedSport can be followed in the Americas on Fubo.TV in USA and Canada, on TDN in Mexico and Central America and on the ESPN network in South America and the Caribbeans. SNTV – the Sports News Television platform will distribute images from the race all over the world. 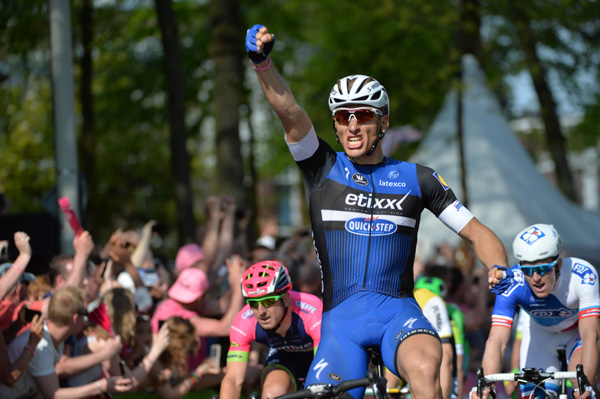 Nijmegen, 7 May 2016 – The German rider Marcel Kittel (Etixx – Quick Step) won the bunch sprint which decided Stage 2 of the 99th Giro d’Italia, 190km from Arnhem to Nijmegen. Arnaud Demare (FDJ) and Sacha Modolo (Lampre – Merida) finished second and third. Sankt Vith, Belgien – BMC Racing Team Fahrer Greg Van Avermaet nutzte am Sonntag eine Soloflucht zum Sieg auf der letzten Etappe der Baloise Belgium Tour und sicherte sich den Gesamtsieg. Van Avermaet konnte den jagenden Tiesj Benoot (Lotto-Soudal) zurückhalten nachdem Benoot und Egor Silin (Team Katusha) auf dem letzten Kilometer der 199,2 km langen Etappe attackierten. Der sportliche Leiter von IAM Cycling, Eddy Seigneur, kündigte an, dass man die Teamfarben beim GP d’Isbergues sehen werde und dass die Mannschaft um den Sieg kämpfen wolle. Arnaud Démare machte der Schweizer Profimannschaft dabei aber einen Strich durch die Rechnung. Der Franzose von der Mannschaft FDJ.fr holte sich wie schon 2013 den Sieg bei diesem Rennen. Dass IAM Cycling knapp dran war, zeigt die Leistung von Heinrich Haussler, der mit seinem dritten Rang für den insgesamt 35. Podestplatz von IAM Cycling sorgte. Damit belohnte er die tolle Arbeit seiner Teamkollegen, welche sich bereits den ganzen Tag für die Mannschaft eingesetzt hatten.